Professional Photo Editing Tools. Redefined. 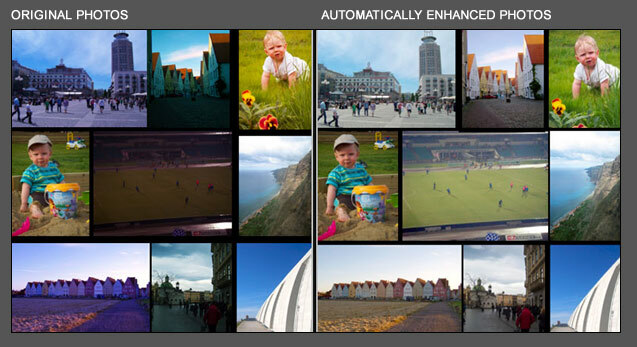 PhotoEQ's automatic color correction fixes color balance, exposure and contrast problems automatically in single step. 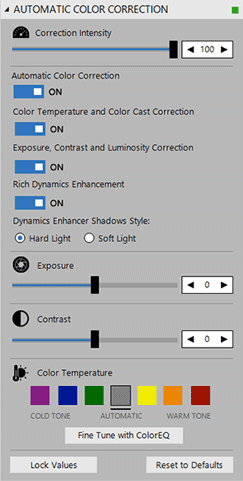 Automatic color correction uses separate layers for white balance, exposure and contrast adjustments. Layer based solution gives you a freedom to tune all color correction adjustments as you want. Our in-house developed intelligent color correction algorithms gives you professional results automatically. 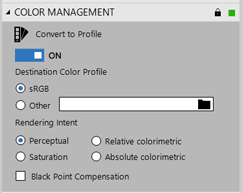 PhotoEQ has full support for standard ICC-profile based color management and it supports embedded profiles. 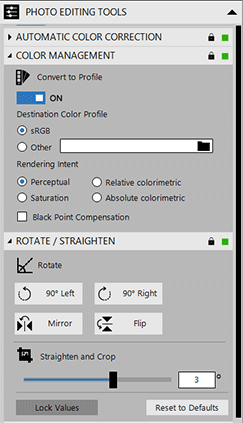 With PhotoEQ's “Convert to ICC Profile” tool you can select icc-profile which defines target color space for saved images. For example you can use PhotoEQ to convert RGB images to CMYK images for printing. You can also set rendering intent method which is used during conversion and usage of black point compensation. Selected icc-profile is embedded to the saved image. If you are not using icc-profile conversion original image’s icc-profile is embedded to the saved image. PhotoEQ reads automatically original image’s embedded profile and uses it while images are presented on the display. If you load multiple files or folders, the first image will be loaded automatically and rest images are placed to todo queue. When you select image from todo queue, selected image is loaded to the application. 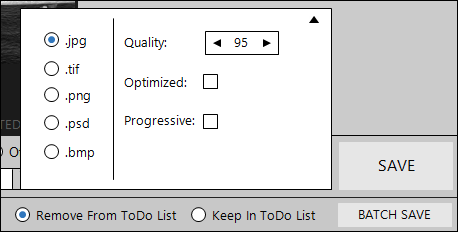 You can batch process and save all files from todo queue by clicking “Batch Save” button. Saved and batch processed images are automatically removed from todo queue. You can lock current adjustments for to-do queue processing. Locked adjustments are automatically applied to new images. PhotoEQ has tools and filters for resizing, cropping, rotating, straightening, sharping, de- noising and red-eye fixing the original image. 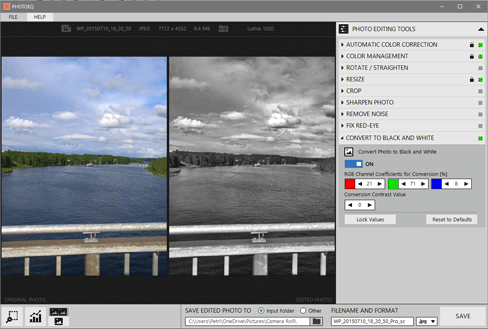 Image editing in PhotoEQ is non-destructive and layer based operation. 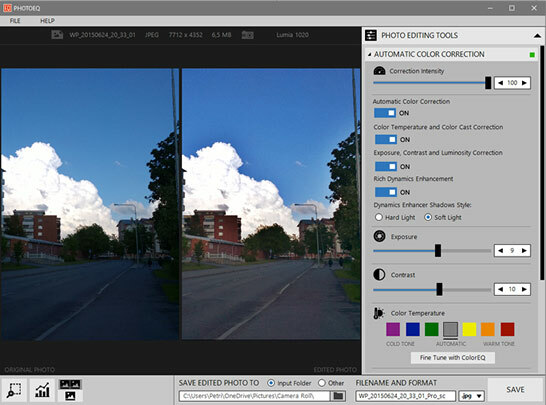 Image editing tools and filters can be used together with PhotoEQ’s color correction or separately. You can lock current adjustments. Locked adjustments are automatically applied to the loaded image. 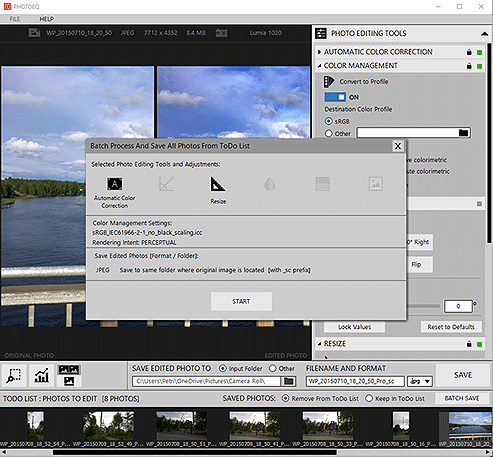 PhotoEQ reads multiple digital image and camera RAW- formats.